An American attorney in Mexico (Michael Fassbender) gets involved in a $20 million cocaine deal with a local badass (Brad Pitt) and soon runs afoul of a merciless international drug cartel. Like Oliver Stone's Savages, this tony crime thriller exploits the brutality of the Central American drug trade for shock value but transpires mainly in the cool, moneyed world of the callous rich. Because it was scripted by Cormac McCarthy, the characters dispense studiously grim and cynical dialogue, and because it was directed by Ridley Scott, their inner lives matter less than their jewels, designer clothing, and fashionably spare living spaces. With Javier Bardem, Penelope Cruz, and Cameron Diaz. 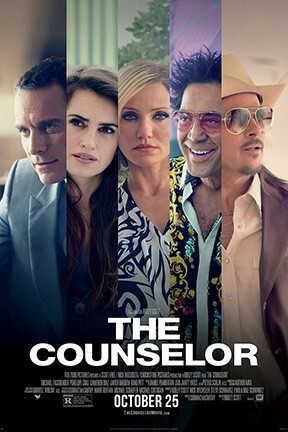 The Counselor is not showing in any theaters in the area.